AUSTRALIAN Open tournament director Craig Tiley is yet to learn if French Open winner Anastasia Myskina's Melbourne Park bid is doomed. Wow. James Blake lost to Ruben Ramirez Hidalgo? A dude who apparently was 0-7 on hardcourts until hitting New Haven? Wow. In other defending champ news, Lindsay Davenport's through. In other upsets, Myskina went down to lucky loser Mara Santangelo (also, Patty Schnyder was ousted Monday by qualifier Sun Tiantian). Here's a wrap of the women's Tuesday matches. Today sees the return of this year's biggest names on the women's tour: Justine Henin-Hardenne and Amelie Mauresmo are back. Yay! I sort of forgot their was another WTA event this week; but congrats to Zheng Jie for beating Anastasia Myskina in Sweden for her 3rd career title. Here's a wrap. Here Jie is with Bjorn Borg. Way for Borg to support Swedish tennis. It's always good to see him. 6-2 6-2 in 57 minutes. I think they call it a beatdown. Here's a match review and a wrap of today's matches in Cincinnati. ETA: Video wrap up of the match. Serena Williams and Anastasia Myskina face off today in Cincinnati. Though Myskina's been playing well, I'm going with Serena in 3 sets. But if Myskina wins, I'll be curious to hear what she has to say. I'm still LOL re: her bitchy post-Jankovic comments at Wimbledon. This is a day late, but too funny to be missed. "She's a really strange player," Myskina told reporters. Henin-Hardenne wins Eastbourne in a 3rd set tiebreak over Myskina; Gasquet becomes the first man ever to defend Nottingham with a 6-4 6-3 win over Bjorkman, Michaela Krajicek straight-setted Dinara Safina at Ordina (a day after beating Dementieva! What a week. ), and Ancic defended Ordina in 3 sets against Jan Hernych. Nottingham: Defending champ Richard Gasquet KO'd countryman Gilles Simon in 3 and 1; Italian Andreas Seppi beat Andy Murray in 3; Robin Soderling, who has yet to drop a set, over Tipsarevic in 2, and Bjorkman over Lopez. 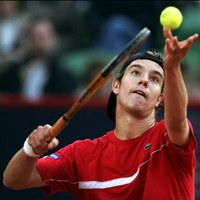 I'm gonna go with Gasquet to repeat his win. At the Ordina Open, Men's, it'll be defending champ Mario Ancic v. Marcos Baghdatis (making his first semi since Australia) and Jan Hernych vs. Forent Serra (who took out JC Fererro in 3). The women: Elena Demetieva, Danilidou, Dinara Safina and Michaela Krajicek. I'm going with Ancic and Safina. Eastbourne: It'll be Henin-Hardenne vs. Clijsters and Kuznetsova v. Myskina. I'm going with Kuznetsova over Henin-Hardenne in the final. One big Russian bear hug from Boris Yeltsin at the conclusion of yesterday's opening match on Court One was enough to tell Anastasia Myskina she was back.